Cars and phones sometimes don’t go together very well. But, with the right tools for the job, you can make full use of your phone’s apps and music as you drive, all without the need for an expensive car mount. Take the binder clips and disassemble them. Take out the arms, and, with the pliers, bend them in an angle as shown in the picture above. These arms are going to be what holds your phone in place. Take the string and wrap it around the arms of the binder clips as shown above. Tie the thread on one side and wrap around the bent part of the arm until it has a tight covering. Wrap the string a few more times around the bent part to make sure the entire thing holds up. Reassemble the clip with the ends bending in toward each other. Take the duct tape and wrap the remaining exposed wire. Put a width of duct tape into the mouth of the clip and pull it over the exposed wire. When you’ve cut the wire to fit, take the excess and wrap it around the back of the wire holding the thread in place to provide a clean, all black exterior. Now, you are ready to hit the streets in your car and your new car holder. It’s designed to easily clip on to your car’s A/C vent louvers and the clips hold the phone in landscape orientation. You can now make full use of your GPS apps to get to your destination in one piece. This car mount also doubles as a stand for your iPhone. 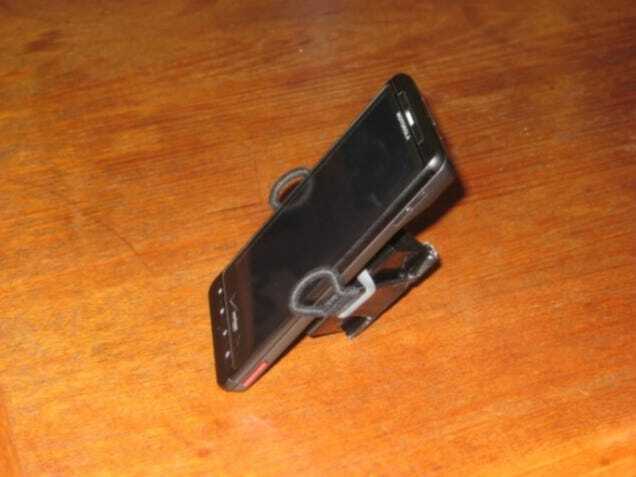 When mounting your iPhone with this, make sure to do so with its case to make sure it will be a perfect fit. It will also fit other smartphones and some larger phones. Orientation depends on where you clip it on.